'Frosty Morn, Canovee' is an oil on paper depicting St John The Baptist's Church and the surrounding countryside on a cold frosty morning. 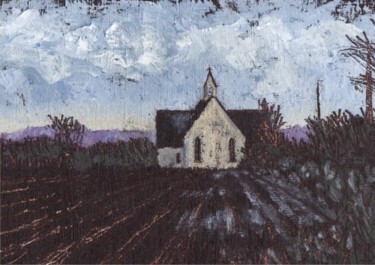 The Church was built in 1869 and so has seen many a frost over the years, for sure. Canovee is just about 2 miles from our home and is very near to Carrigadrohid village. I have many memories of this beautiful place as I've run art classes with the Canovee Circle of Friends Art Group in the old school next door to the Church for almost a decade. The painting is in a wooden frame painted old-ochre and is currently on exhibition at the Lavit Gallery in Cork city. A set of limited edition prints, signed and stamped by the artist, is available; email Mícheál for full details.